Editor's Note: On the 18th of Av we commemorate and remember the victims of the Hebron Massacre, in which sixty seven Jews, including babies and children, were brutally murdered by Palestinian civilians and policemen in the ancient city of Hebron. Those who survived were badly maimed and mutilated and were forced out of the city and taken to Jerusalem. Their property was left behind and was seized by the Arabs. Because of the bravery and dedication of individuals like Sarah Nachshon, there is once again Jewish access to our holy sites and a thriving Jewish community in the city of Hebron. A famous philosopher once said that human beings can suffer through any "what" as long as they have a good enough "why." You can put up with hunger pains, for example, if your hunger means that you will be able to fit into your wedding dress in time for the ceremony a month from today. 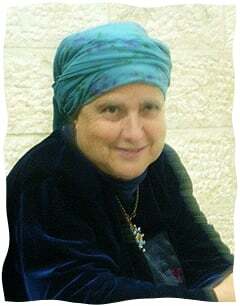 For me, the most remarkable aspect of Sarah Nachshon's very remarkable life is the way in which her "why," the mission to rebuild the Jewish community of Hebron, has enabled her to keep a smile on her face throughout "whats" that would have brought most of us to our knees. While I heard her story, I could not help but imagine myself in the situations she described. I imagined myself pregnant, sharing one room with seven children, living without electricity, and carrying twenty-five liter jerry cans of water long distances in order to fill my baby's bottle. I don't think I would have lasted more than an hourI don't think I would have lasted more than an hour or two. In contrast, Sarah Nachshon's absolute clarity of purpose and unwavering sense of mission have enabled her to repeatedly sacrifice her own personal needs with love and even enthusiasm. Her rare clarity, together with her tremendous humility, have caused many admirers to refer to her as "a modern-day Sarah, our Matriarch." Sarah Nachshon grew up in the village of Kfar Chassidim in the north of Israel. Her parents had fled from Poland several months before World War II, and despite their poverty, she has sweet memories of her childhood. "My family lived in a small shack, and we didn't have any toys or anything else. I had only one dress, and if I wanted to wear another dress I had to trade with one of my friends. But I will tell you something - I had a wonderful childhood. My parents taught me to be happy with what I have, and that is a value that I have worked hard to pass on to my own children as well." Growing up, Nachshon also learned from her parents the value of self-sacrifice for the land of Israel. "I remember the stories my parents told us of how they fought against the British in order to establish the State of Israel. My parents taught me that if the Jews want to keep the Land of Israel, then we must fight for the Land of Israel. If we don't fight for it, they taught me, we will lose it, G‑d forbid." 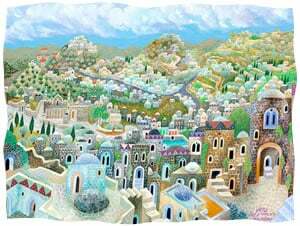 After the Six Day War in 1967, Nachshon and her husband, the respected Chassidic artist Baruch Nachshon, joined a group of idealistic activists determined to reestablish the ancient Jewish community inside newly-liberated Hebron. The Lubavitcher Rebbe encouraged them and endowed them with many blessings for their efforts. These activists understood the supreme importance of establishing a Jewish presence in the oldest of the Israel's four holy cities, where a Jewish community had existed for hundreds of years until the massacre of sixty-seven Jews by local Arabs in 1929. 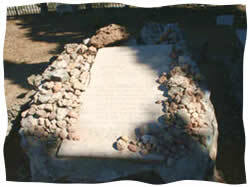 They also understood that maintaining a Jewish community in Hebron would be the only way to guarantee continued Jewish access to the Cave of Machpelah, the burial site of our Matriarchs and Patriarchs and the second holiest site in Judaism which until 1967 had been barred to Jews by the Muslim authorities for over 700 years. In 1968, the Nachshons and their four young children moved with this group of activists into an Arab-owned hotel inside Hebron. Nachshon recalls, "An army official came to meet with our group, and told us that we were a big pain in his neck. But he told us that because the government feared for our safety, they had reluctantly agreed that a group of seven families and fifteen yeshiva students could stay in Hebron if we would move into an army compound overlooking the city. "They thought that our dream to live in Hebron would die""They assumed that we would not be able to tolerate the terrible conditions for long - living in one room with all of our children, only one kitchen for all of us to share, and with the only bathrooms outside. The army saw us with our little children and thought that within a few weeks we would give up and leave. They thought that our dream to live in Hebron would die right then and there." But the army underestimated the determination of this small but committed group. Over those three years, not only did the families not move out; thirty more families moved in. While living in the army compound, Sarah Nachshon gave birth to three more children, and repeatedly risked imprisonment by defying government orders and circumcising her newborn sons at the Cave of Machpelah. When the mohel, the ritual circumciser, performed the first circumcision at Machpelah in over 700 years on Nachshon's son, he wept as he said the blessing over "the covenant of Abraham our father," in the burial place of the Patriarch himself. Despite the challenging physical conditions, Nachshon remembers the years she spent at the army compound with much nostalgia. She recalls, "When we were living in the army camp, my sister visited us from her home in Canada at the beginning of one of my pregnancies. She asked me, 'Sarah, do you mean to tell me that you will spend this whole pregnancy living in a place with an outdoor bathroom?' I told her, 'I'll tell you something! I am happier to live in one room in the Land of Israel than in a palace in Canada!' Afterwards, when we moved to a larger apartment, my children missed the army compound so much. They were so sad that they could no longer sleep together with all of their siblings in one room." The terrible morning that Nachshon found her baby lifeless in his crib, her husband was out of town, and there was no way to reach him. As she made the preparations for the burial all on her own, while she wept and prayed she tried to remind herself that everything G‑d does is for a purpose, even if it is hidden from us. Suddenly, she understood that her lost son was meant to play a sad but vital role in the rebuilding of the City of the Patriarchs. "I decided," she recalls, "that we would bury him in Hebron. Our Avraham Yedidya would be the first Jew buried in the ancient Jewish cemetery of Hebron since the burials of the sixty seven Jews massacred in 1929." Sarah Nachshon was holding her baby wrapped in a sheetRoadblocks and Israeli soldiers who had been given orders to prevent a burial in the ancient cemetery lest it anger the local Arabs, blocked the funeral procession of cars from Kiryat Arba. Sarah Nachshon got out of her car holding her baby wrapped in a sheet. She addressed the soldiers, "Are you looking for me? Are you looking for my baby? My name is Sarah Nachshon. Here is my baby, in my arms. If you won't let us drive to the cemetery, we will walk." As darkness fell, and the mourners got out of their cars and started walking in the direction of the cemetery, senior army officials continued to order the soldiers over their walkie-talkies, "Stop them! Do not let the funeral procession reach the cemetery under any circumstances!" But the soldiers, unable to turn back this young mother grieving for her lost child, radioed back their superiors, "If you want to stop this woman, come down here and stop her yourself!" One of the soldier got out of his command car, and as he wept he begged Sarah Nachshon, "Please, Mrs. Nachshon, it is too far to walk! Please permit me to drive you to the Jewish cemetery." Thirty-two years later, tears still come to Sarah Nachshon's eyes when she remembers the words she said to the hundreds of people who gathered that summer night to bury her son. "I told them, 'It has been a hard day, but there is something I must tell you. I, Sarah, am holding my dead baby, Avraham, in my arms. And just as Avraham our Father came to Hebron to bury his Sarah, so too I, Sarah, have come here to bury my Abraham. At this moment, I know why G‑d gave me this irreplaceable gift for only six months. To reopen the ancient Jewish cemetery of Hebron.'" In 1980, she and her children joined a group of fifteen other mothers and thirty children who cut through barbed wire and defied government orders by entering the abandoned Jewish hospital Beit Hadassah in Hebron. The army and government had assumed that if they prevented the husbands from entering Beit Hadassah, the women would not be able to make it on their own. But weeks turned into months and not only were the women not leaving – but they succeeded in establishing a school within the building, and other programs to keep the children occupied and happy. They lived without electricity, running water, and in substandard conditions, forbidden to leave the building lest the army prevent them from reentering. But they weren't budging. These women were stronger than anyone could have imagined. These women were not allowed to meet with their husbandsThese women were not allowed to meet with their husbands or leave the building. But on Friday nights, when the men were returning home from prayers at the Machpelah Cave, they would stand outside of Beit Hadassah and serenade these heroic women with the traditional Friday-night song Eishet Chayil, A Woman of Valor. As a direct result of this group's tremendous self sacrifice, the Israeli government at long last agreed to the establishment of a Jewish community within Hebron. Today, the Hebron Jewish community numbers 800 residents, with hundreds more waiting to move in as soon as apartments become available. To this day, Sarah Nachshon leads groups of women to the Cave of Machpelah, and is active in the struggle to open all of the halls of Machpelah to Jews 365 days a year. She fills her days performing acts of kindness for her family, friends, neighbors, as well as complete strangers. On an average day you will find her babysitting for one of her over seventy grandchildren (she knows all of their birthdays by heart), volunteering with the elderly at her local senior's club, or using her vast knowledge of alternative medicine to treat a sick neighbor. As one friend explained, "It's easier to make a list of what Sarah Nachshon doesn't do than what she does do." Sarah Nachshon, in other words, is living proof that when you live for a "why" that is greater than yourself, you can become a person who is so much greater than if you only live for yourself. So inspiring! Thank you for sharing this very special, heroic, and inspiring story! [I am compelled to point that there is one error. You wrote: "On August 2nd, 2007, (the 18th of Av) we commemorate and remember the victims of the Hebron Massacre, in which sixty seven Jews, including babies and children, were brutally murdered by Palestinian civilians"
Thank you Thank you for sharing this amazing story of a great woman. I would just like to point out that in the Editor's note, at the beginning, it mentions the terrible massacre of the Jewish residents of Chevron by 'Palestinians.' At that time the arabs had not yet dreamed up the 'Palestinian' identity and were simply arabs who turned on their Jewish neighbours with whom they had lived side by side for centuries. Thanks to the bravery of Mrs. Sara Nachshon and the other wonderful Jewish women, we can now pray in the holy resting place of our ancestors. They are truly an inspiration to us all, showing us how to live fearlessly as Jews in our own land.